In this article I argue that the organization theory perspective of boundary objects can usefully enrich the studies of the presentations of the Soviet past in museums. I draw on Susan Lei Star’s and James R. Griesemer’s concept of boundary object to show how diﬀerent objects and material structures are attributed to the Communist era, assembled as cultural heritage and translated between diﬀerent ﬁelds of professional expertise and institutional politics. Focusing on three cases of museums in Lithuania, I show that the museum expositions about the Soviet past should not be understood as a result of a linear, top-down dissemination of the oﬃcial views endorsed by the governing elites. In contrast, I propose that these museums are better understood as sites that host many diﬀerent social processes, where diﬀerent groups compete over the management of boundaries of the relics of the Soviet past. Rindzeviciute, Egle (2018) Boundary objects of communism : assembling the Soviet past in Lithuanian museums. Ethnologie Francaise, 2018(2). This article uses the metaphor of overflow to understand the role played by the revelation of previously secret experience in the controversial Museum of Genocide Victims in Vilnius, Lithuania. It shows how efforts to disclose Soviet repression and to consolidate and sustain a particular community of survivors, the Union of Political Prisoners and Deportees, produced an “excess” of revelation in a context of radical political change, which in the process led to a failure to represent the complexity of Lithuania’s past, by sidelining the Holocaust in its narrative of repression. In contrast to other studies that understand this Museum as an instrument of a particular governmental ideology, I suggest an alternative explanation of the origins and character of this museum, arguing that it should be understood as a community museum. I argue that the Museum’s failure to provide a balanced presentation of the past is better understood as an effect of an excessive desire to reveal the particular experiences of this community, which I describe as an overflow of meanings, not merely a result of the governmental elite’s will to suppress alternative versions of the past. Rindzevičiūtė, Eglė. 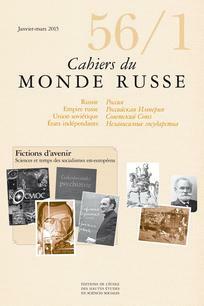 “The Overflow of Secrets: The Disclosure of Soviet Repression in Museums as an Excess”. Current Anthropology vol. 56 (2015): S276-S285. European Studies, vol. 30 (2013): pp.65-93. Central Europe, vol.8, no. 2 (2010): pp.180-202. Culture Unbound, vol.2 (2010): pp.665-694. Aronsson P. and GradenL. (eds) Performing Nordic Heritage. Aldershot: Ashgate, 2013, pp. 221-246. 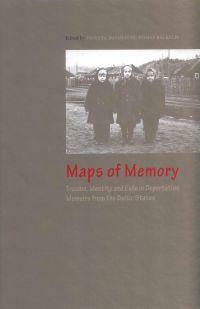 Balkelis T. & Davoliute, V. (eds) Maps of Memory: Trauma, Identity and Exile in Deportation Memoirs from the Baltic States, Vilnius: LLTI, 2012, pp.153-177. 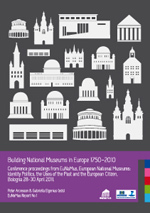 Aronsson, P. & Elgenius, G. (eds) Building National Museums in Europe 1750–2010. EuNaMus Report No. 1. Linköping: Linköping University Electronic Press, 2011, pp. 521-52. Policy change is frequently framed as resulting from governmental strategy based on explicit preferences, rational decision-making and consecutive and aligned implementation. This article instead explores the theoretical perspective of institutional work as an alternative approach to understanding policy change, and investigates the construction of resources needed to perform such work. The paper is based on a case study of the process wherein the idea of cultural and creative industries was introduced into Lithuanian cultural policy. The main data generating methods are document studies and qualitative interviews. The analysis demonstrates the ways in which the resources needed to perform institutional work are created through the enactment of practice, and through the application of resourcing techniques. Three such techniques are identified in the empirical material: the application of experiences from several fields of practice, the elicitation of external support, and the borrowing of legitimacy. The study offers an alternative approach to studies of policy change by demonstrating the value of institutional work in such change. Further, it contributes to the literature on institutional work by highlighting how instances of such work, drawing on a distributed agency, interlink and connect to each other in a process to produce policy change. Finally, it proposes three interrelated resourcing techniques underlying institutional work. “Post-Soviet Transformation of Lithuanian State Cultural Policy: The Meanings of Democratisation”. Cultural Policy and Democracy, edited by Geir Vestheim (London & New York: Routledge, 2015). The International Journal of Cultural Policy, vol. 18, no.5 (2012): pp.563-578. 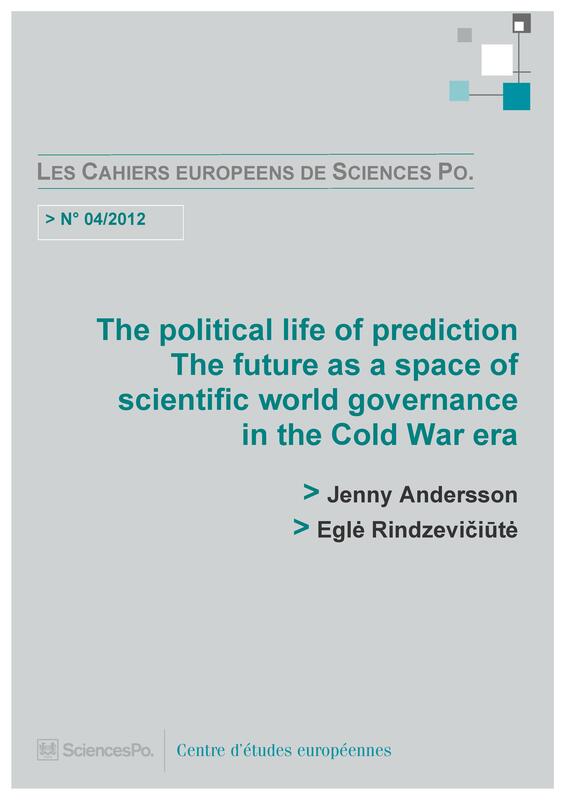 “The Political Life of Prediction: The Future as a Space of Scientific World Governance in the Cold War Era”. Les Cahiers européens de Sciences Po, no.4 (2012): 1-25. “From Authoritarian to Democratic Cultural Policy: Making Sense of De-Sovietisation in Lithuania after 1990”. 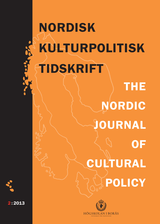 The Nordic Journal of Cultural Policy, vol. 12, no. 1 (2009): pp.191-221. This article introduces non-Western policy sciences into the burgeoning field of the intellectual history of Earth system governmentality, a field that studies the ideas, institutions and material systems that enable action at the global scale. It outlines the rise of debates on the idea of the governability of the global biosphere in late Soviet Russia (1970s–1980s), focusing particularly on the extension of Vladimir Vernadskii’s famous theory of the biosphere and its governance (the stage of the noosphere) into computer modeling and systems analysis. As a result, a new notion of governance as guidance through milieu arose to conceptualize global governance of the biosphere. This conceptual innovation was part of Soviet scientists’ attempt to liberalize the centrally commanded Soviet governmental system. This article introduces the history of Soviet scientific future studies after World War II, discussing in detail the foundational debates among Gosplan economists in 1966 and providing a new perspective on the work of the most famous promoter of Soviet social forecasting, Igor’ Bestuzhev-Lada. It argues that the theory and methods of scientific future studies undermined the utopian certainty of the Communist future and made it clear that Soviet governmentality had to acknowledge the intrinsic uncertainty of future development. The emphasis on uncertainty, but also the need for more data which would be freely circulated across different branches, and hence more transparency, called for radical revisions of Soviet notions of effective governance. Whereas some used future studies to criticize the actual practices of Soviet economic planning, others used this new type of expertise to extend personal influence and accumulate organizational power. Both cases, however, made it clear that Soviet governance had to accommodate the shift to new constellations of power/knowledge in which scientific experts would play an ever increasing role in shaping policy with regard to a fundamentally uncertain future. This article examines the ways in which future as a dimension of goal-oriented behaviour was used to organise and legitimise informal practices of management and planning in the Soviet Union. This study introduces hitherto unexplored history of reflexive management under the authoritarian regime focusing on the work of the Russian philosopher and management guru Georgii Shchedrovitskii. Drawing on the cybernetic notion of teleology, which posited reflexive goal-setting as a key condition of control, Shchedrovitskii taught Soviet managers to formulate their own goals, thus contributing to the erosion of the Communist Party’s monopoly of goal-setting. Furthermore, through the means of organisational-business games this new teleology not only transformed bureaucratic administrations into informal collectives, but also provided informality with an unprecedented legitimacy, emancipatory in the Soviet context, but highly ambiguous in post-Soviet era. “When Formal Organisations Meet Informal Relations in Soviet Lithuania: Action Nets, Networks and Boundary Objects in the Construction of the Lithuanian Sea Museum”. 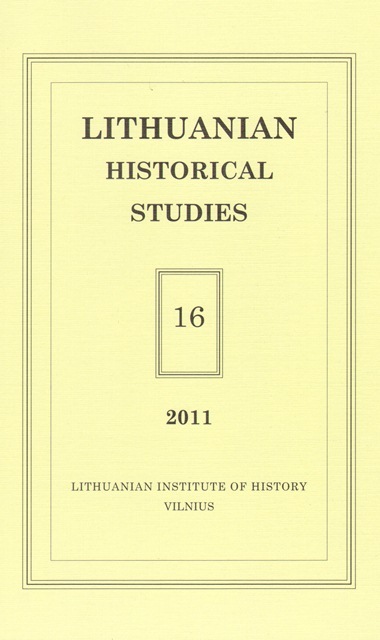 Lithuanian Historical Studies 15 (2011): pp. 107-134. “The Politics of Governance in an Authoritarian Regime: Hybridization and Purification of Cybernetics in the Soviet Union”. 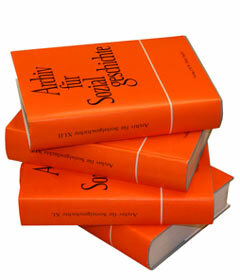 Archiv fur Sozialgeschichte, 50 (2010): pp.289-309. Journal of Baltic Studies 34, no. 1 (2003): pp. 74-91. Ethnicity Studies 2003. Social Adaptation of Ethnic Minorities, pp. 110-123.